So you want to get away from it all? 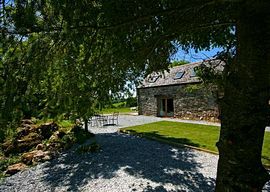 Welcome to Sunridge Lodge, private luxury holiday accommodation hidden away amongst the undulating hills and bubbling streams of the Yealm valley, South Hams, Devon. Here you can enjoy the sound of tranquilty, night and day, dawn to dusk. If you want privacy and peace, and be in an area of outstanding beauty, then you've found the right place. 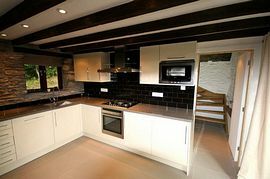 The Lodge is actually a converted barn, spacious, warm, practical and very comfortable. Originally built over 200 years ago, now renovated and modernised, it's still very much a traditional Devon dwelling, with stone walls, exposed beams and a solid oak and glass staircase leading to the bedrooms. The rustic charm of the barn combined with the modern interiors make for a smart combination of atmosphere and ambience - a place you will feel relaxed in, free from the worry and bother of neighbours and passers-by. * 1 double bedroom & 1 open plan mezzanine bedroom with 2 single beds. 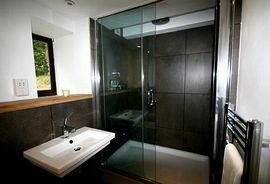 * 1 luxury bathroom with large drench shower, mood lighting & underfloor heating. * State of the art kitchen with large glass gas hob, intergrated microwave, washer-dryer, dishwasher and electric oven. * Contemporary dining and living space with large glass fronted log burner & Underfloor Heating. 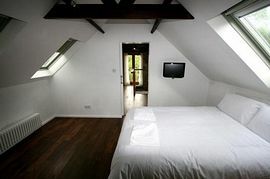 * Flat screen HD TVs with freeview, CD-DVD players & iPod docks in bedrooms and the living space. * All bed linen & towels included. * Locally sourced food hamper available on request. Please contact us if you have a special requirement for a break. Secluded and tranquil luxury retreat . We are pet-friendly; your furry family members will love running through our woodlands and playing on our lawns. 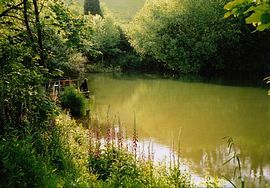 Sunridge Lodge is in the beautiful South Hams. The closest village is Yealmpton. Please contact us for directions to Sunridge Lodge. Weekly prices range from: £695.00 - £1;295.00. The Sunridge standard holiday week is from Saturday to Saturday (this is flexible). Short breaks are also available all year with a minimum of a 2 night stay.